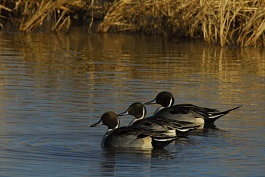 KINGMAN, Ariz. — Young hunters who want to learn all about waterfowl hunting are invited to attend the annual Pintail Slough Junior Waterfowl Camp, sponsored by the Arizona Game and Fish Department. The camp will take place Jan. 6-7 (hunters check in Jan. 5) at Havasu National Wildlife Refuge. The deadline to register is Dec. 22. The event is limited to 18 hunters between ages 12 and 17 (each must be accompanied by an adult). No prior experience is necessary. All young hunters will learn how to identify, hunt and clean waterfowl before putting those skills to use in the Pintail Slough duck blinds. To request an application, contact Elise Theel at etheel@azgfd.gov, or call the department’s regional office in Kingman at (928) 692-7700. A refundable $40 registration fee is required. All participants will be chosen through a random draw and will be notified by e-mail or telephone.